Venture on a quest through the freezing realm of the mountains with this mythical-themed online video slot from NYX. 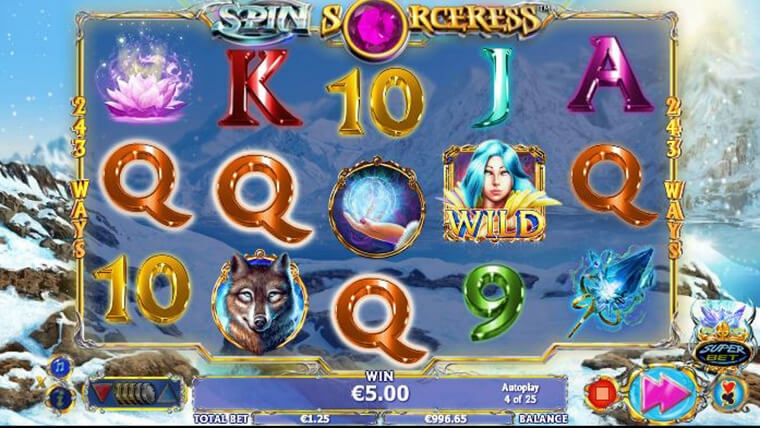 The Spin Sorceress will guide your path to multipliers of up to 50x, free spins, random wild reels and will aid you in your quest to land on the 243 paylines. With a minimum stake of only €0.25, an RTP of 97.06% and the Super Bet option, this looks like a promising slot both in terms of payouts and gameplay. The Sorceress Wild – appears only on reels 2, 3 and 4 and will substitute for all other symbols except for the Scatter. Sorceress Wild Reels – is triggered at random on any spin and can turn reels 2, 3, and/or 4 completely wild. Free Spins – land 3 or more Scatters anywhere on the reels and 10 Free Spins will be granted to you. This feature can be retriggered, while the extra spins are in play. Alos, during the extra spins, three reels will completely turn wild. Gamble feature – you can choose to double any win, by guessing correctly the colour of the next card; to quadruple your wins, guess the suit of the following card.